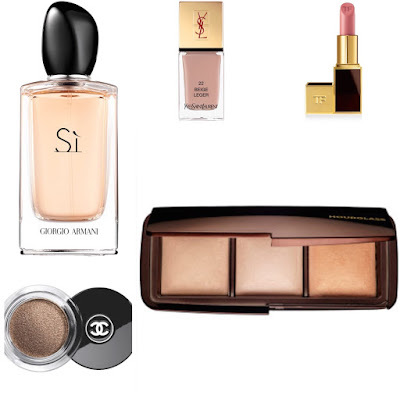 I thought it would be fun to do a post on the beauty products I have on my 'Wishlist', this is definitely not my whole Wishlist as we would be here all day so I thought I would pick the things I find myself daydreaming about the most. They're all high end which is exactly why they are things I won't just go out and buy on a whim, they're pricey and not something I can regularly justify. But hey, a girl can dream! 1) YSL La Laque Couture in 22- I have never owned a proper 'high end' nail polish before because I've just always thought they were a bit overpriced however when I spotted this in my best friends collection the other day I was putting it on my nails before she had a chance to realise! I love this so much, the colour is really understated and sophiticated (not something I usually go for, ha!) and it's lasted nicely. 2) Armani Si Perfume- I first gave this a whiff a few months back and proceeded to spray it all over myself, I have since resisted buying it but I feel like 2016 will be the year I add this to the collection! 3) Tom Ford Lipstick- These are a complete luxury product but I've heard so many great things about them (I would hope so for the price tag!) that I want to join the club! I feel I can justify it if I buy a wearable, every day shade right....? 4) Chanel Mirage- I'm a follower of ViviannaDoesMakeUp and I've heard her talking about this cream eyeshadow so much over the last few months. I've now found myself trying it out at several Chanel counters and walking away thinking 'One day you'll be mine you little bugger'. It's the most gorgeous bronze shade and perfect for people who are lazy with their eyeshadow looks i.e. me. 5) Hourglass Ambient Lighting Palette- This thing has been around for ages and I sometimes feel like I'm the only person on the planet who doesn't own it. These powders just look so bloody good and I want in! What products have you got your beady eyes on? Do you have any of the products I want? I'd love to know!